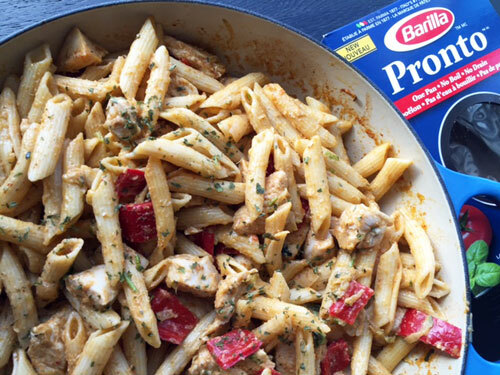 panang chicken penne…and a barilla giveaway! Pasta is always a go-to for anyone wanting a quick and filling meal. Barilla has found a way to get pasta done even quicker! With their new Pronto line, there is no waiting for water to boil or no need to drain the water. For someone like me who has no patience, this is a very great feature. 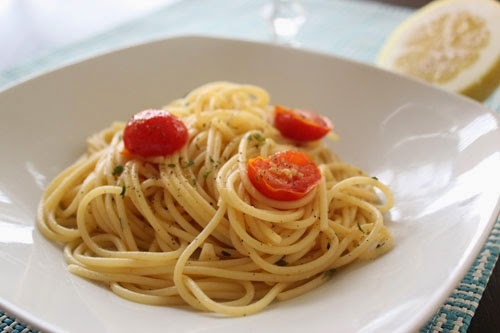 Basically, you cover the pasta with cold water and cook it on high heat until the water is absorbed, around 10 minutes. I was actually quite surprised at how perfect the pasta cooked. 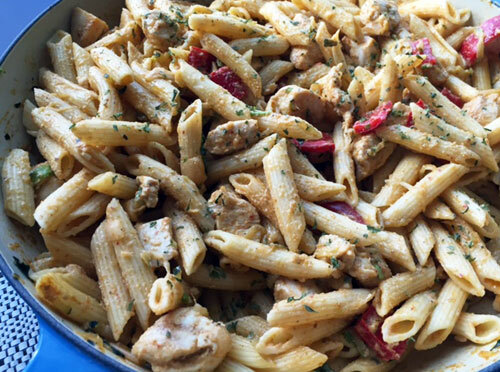 I tried out Pronto and made this quick Panang Chicken Penne. The chicken and sauce cooked while the pasta boiled and dinner was ready in no time. and will have 48 hours to reply back. Good luck! Cook the penne according to package directions. Heat oil in a pan and stir-fry the curry paste with the vegetables. Add 1 cup of coconut milk and the chicken and let cook. Add the remaining coconut milk, water and sugar and heat until boiling. Add the cooked pasta and stir until the pasta is coated with the sauce. Enjoy! The best part of summer is the gatherings with friends. Barbecues and potlucks and beach picnics, the great weather is always a great excuse to get together. Here’s an easy dish for your next potluck. 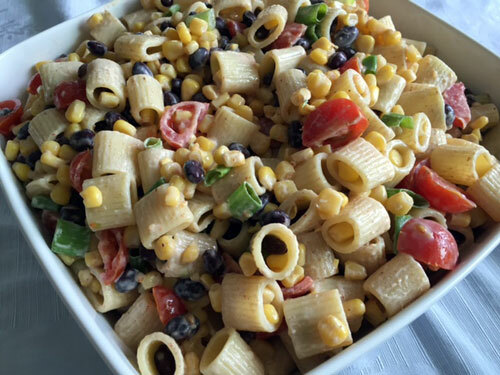 Pasta salad seems to be a staple at most parties but kick it up a notch with a Mexican flair. Use your favourite pasta and toss it with whatever veggies you have on hand. The salad is tied together with a dressing made with sour cream and taco seasoning. Easy peasy and super tasty! Combine the the pasta with the vegetables. In a bowl, combine the sour cream with the taco seasoning. Toss with the pasta mixture. Serve cold. Around here, we are huge fans of tacos. Soft wraps or hard shells, we love them all. With tacos being so easy to prepare and everyone loving them, they are likely to be seen on the menu once a week. 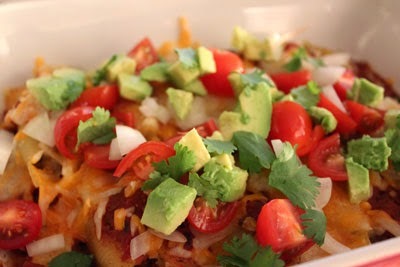 Our new favourite way to eat tacos is in a casserole! While boiling a pound of pasta, we cook off some ground beef with taco seasoning. 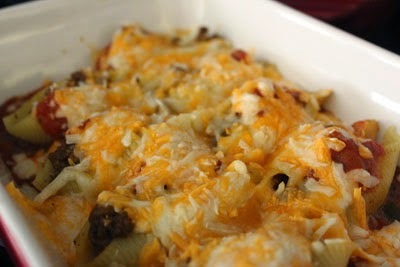 When both are done, we combine the two, put them in a casserole dish and cover the mixture with cheddar cheese. The dish is baked until the cheese is ooey and gooey. 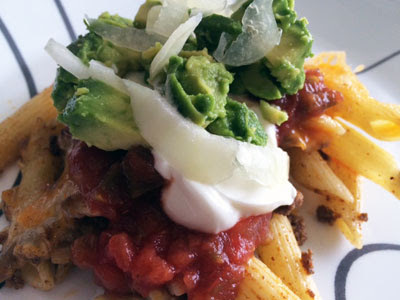 When we are ready to eat, we top the pasta with salsa, sour cream, onions, tomatoes and avocados. It’s like eating a taco with a fork! Perfect for taco Tuesday! When I stayed at the Banff Springs Hotel a couple months ago, I indulged one day with their Grown-Up Mac and Cheese – a pasta dish made with Boursin and lobster. It was a comforting meal and was so delicious. I’ve been thinking about it ever since I ate it. I decided to give it a go, and make some Mac and Cheese tonight. I’m hoping Q will love it and that it will be a hit for school lunch. Using this recipe as a reference, I made the pasta dish with lots of mushrooms. I ended up not putting the pasta in the oven with breadcrumbs because I wanted the dish to be creamy through and through. 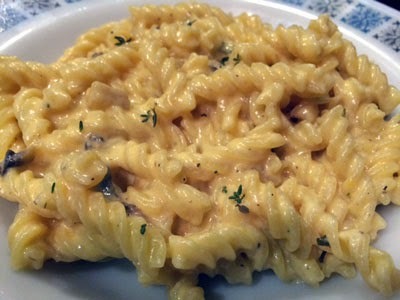 The addition of three different cheeses – Boursin, Cheddar and Parmesan – made the dish ooey and gooey. This pasta dish was definitely a splurge but oh so worth every single bite! Cook the pasta in boiling salted water, following package directions. Drain and set aside. In a large saucepan, melt 2 tablespoons of butter over medium-low heat. Add the mushrooms until they are cooked. Add 2 TB butter and add the flour and stir until well blended and bubbly. Add salt and pepper, and the milk. Cook, stirring, until thickened. Add the herbs, Boursin cheese, and Cheddar and Parmesan cheeses. Cook, stirring, until cheeses have melted. Stir in the drained pasta. Indulge! 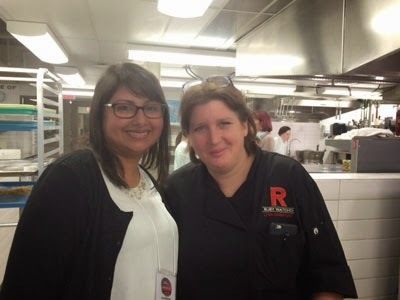 A couple weeks ago, I had the opportunity to spend an evening with some fellow bloggers learning about Catelli’s Healthy Harvest Ancient Grains Pasta from none other than Chef Lynn Crawford! 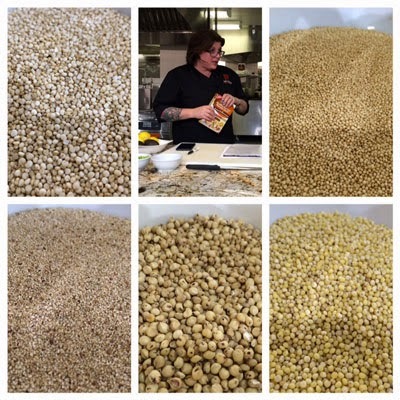 Catelli’s new pasta is made with five ancient grains – quinoa, amaranth, teff, sorghum and millet. 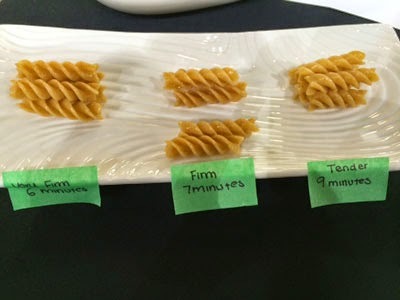 Currently available in Western Canada, the pasta is available in three cuts – Spaghetti, Spaghettini and Rotini. We were so lucky to have Chef Lynn make us a couple of tasty treats. 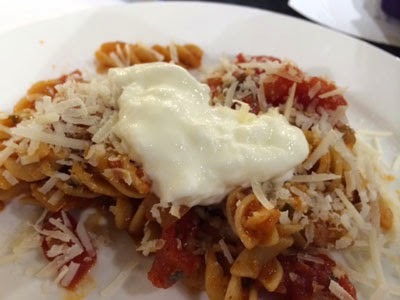 The first was Rotini in a Marinara sauce topped with cheese and fresh mozzarella. 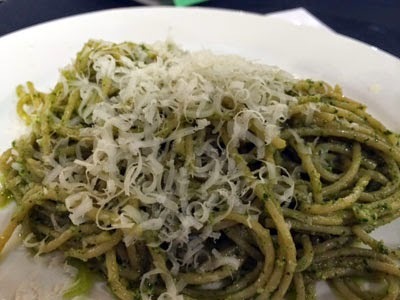 The second was the Spaghettini, tossed with pesto and cheese. So delicious! 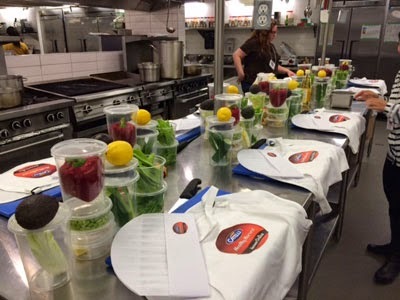 She shared some great tips with us – use the stems of cilantro, think salty sea when salting the pasta water, never rinse the pasta after cooking for sauces to better adhere to the pasta. 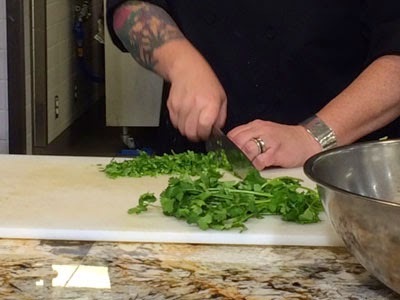 Chef Lynn then proceeded to show us how to make her Chilled Noodle Salad with Ginger Wasabi Dressing. We then headed to the kitchen to make it for ourselves. It was such a fun and memorable evening! 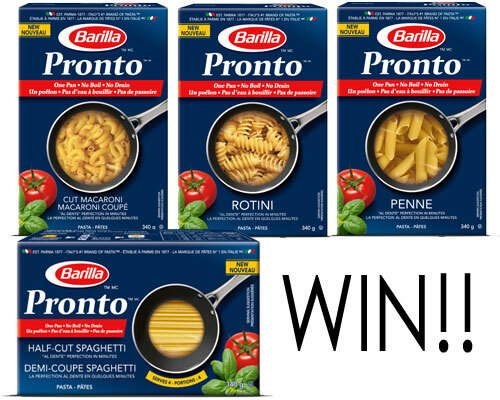 Want a chance to win a one year supply of Catelli Healthy Harvest Ancient Grains pasta? Enter below! Cook pasta according to package directions; drain well. Rinse under cold water until well chilled; transfer to large bowl and set aside. In a pot of boiling water, cook snow peas and edamame until tender-crisp. Drain and rinse under cold water until well chilled; set aside. Meanwhile, halve the cucumber lengthwise and use the end of a spoon to scoop and discard seeds; cut cucumber into julienne strips. Ginger-Wasabi Dressing: Whisk together rice vinegar, canola oil, soy sauce, lemon juice and zest, brown sugar, sesame oil and ginger. Season with wasabi to taste. 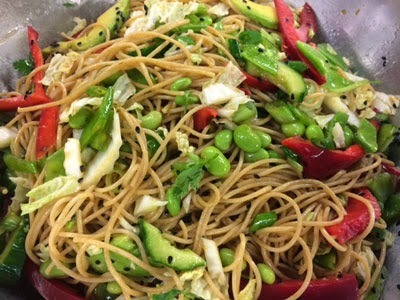 Add cucumber, snow peas, edamame, napa cabbage, red pepper, green onions and avocado to noodles; toss with enough dressing to coat. Garnish with cilantro leaves and black sesame seeds. Tip: If you have time, you can chill the noodle dish by refrigerating for 1 to 4 hours. In the last few weeks, Q has decided that Tuesdays are for tacos. Since they are quick and easy and loved by us all, we are happy to indulge his desire for Taco Tuesdays. A couple of weeks ago, I decided to put a spin on things – Mexican Pasta Shells. 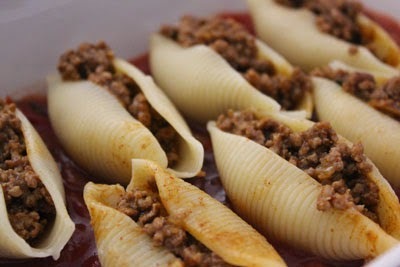 Inspired by K, my former co-worker, large pasta shells are filled with seasoned taco meat, covered in salsa and cheese. 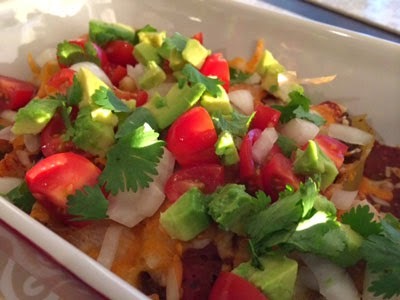 The baked dish is then topped with everything you would put in a taco. I wasn’t sure what Q’s response would be. He is sometimes finicky with pasta, usually choosing other things over it. This dish, however, was a hit! I’m always thrilled anytime he goes back for seconds of anything. There’s not really a recipe for this per se. I use taco seasoning when browning my meat. 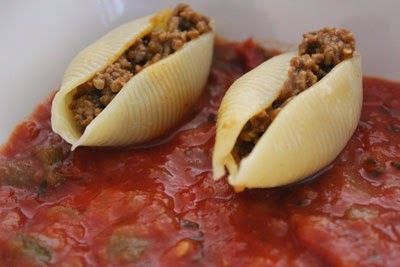 I stuffed the cooked shells with meat and layed them in a dish on top of salsa. I put more salsa on top and then covered it with cheese. Bake in a 350 degree oven until the cheese is melted. In K’s recipe, the taco meat is mixed with cream cheese. Hubby is lactose intolerant though, so I held off on the cream cheese. His portion of shells were also not covered in cheese. Once out of the oven, top with onions, tomatoes and avocado and serve with sour cream. An easy and filling dish that’s everyone’s favourite. Lemon and garlic, they are a pair that go so well together! Last week, when I needed something quick for dinner but didn’t want to skimp on the flavour, this pasta did the trick. The sauce came together while the pasta cooked and dinner was on the table in no time. It was perfect with a crusty baguette and was a light dish. Just add some shrimp or chicken to please the non-vegetarian people in your life! Cook the pasta according to the box. While the pasta is cooking, heat some oil and saute the garlic. Add the wine and lemon along with the cherry tomatoes until they start to pop. Once the pasta has been cooked, add to the pan and season with salt and pepper. Super quick and super tasty! I have a new favourite pasta sauce / dressing! After seeing so many people post pictures of the avocado pasta on Instagram, I decided that it was something I needed to try. I know the recipe is in Angela Liddon’s new “Oh She Glows” cookbook but I was so happy that I was able to find it on her blog. With lemon, garlic and basil incorporated into the creaminess of the avocado, it is perfect on pasta – so fresh and flavourful! I find it also goes great with salad, brightening things up immensely. 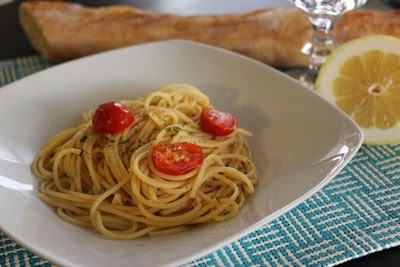 The sauce comes together easily in a food processor and was so simple to make. Q took charge of this one, tossing things in. He loved it so much, he licked the processor bowl! 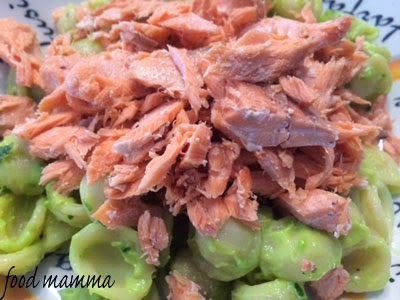 We threw the sauce with orecchiette and topped it with roasted salmon. Just thinking about that satisfying meal makes me hungry. Place the garlic cloves, lemon juice, and olive oil into a food processor. Process until smooth. Add the avocado, basil and salt. Process until smooth and creamy. Pour sauce onto pasta and toss until fully combined. Serve immediately. 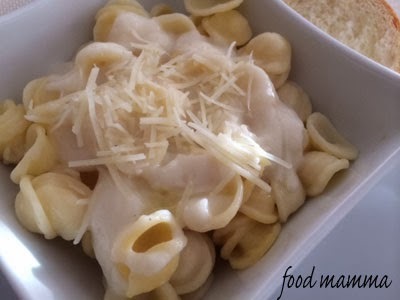 The other day, on Facebook, I noticed a recipe for cauliflower alfredo sauce. I was intrigued and knew I had to try it. Cauliflower seems to be the “it” vegetable lately, transforming into a variety of things like “bread” sticks and pizza crusts. This sauce is super easy to make. 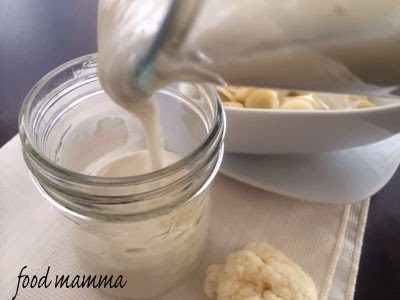 In a blender, just whiz together the cauliflower, the water that it was cooked in, some garlic that’s been cooked in butter and a little bit of milk and you have a creamy, delicious sauce. I used a lactose-free milk so that the sauce could be enjoyed by everyone. 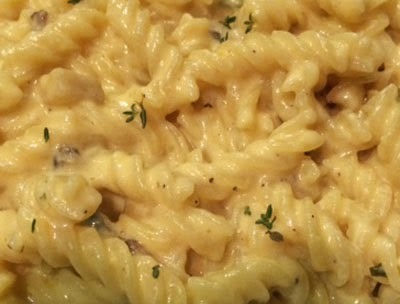 Top the pasta and sauce with some cheese and elevate the dish even further with a drizzle of truffle oil. So divine! 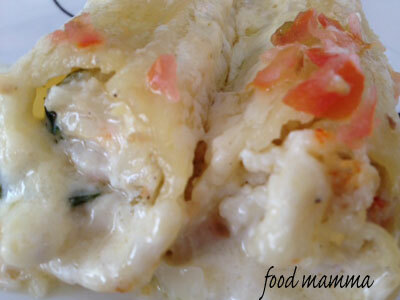 It’s a perfect dish for Meatless Monday or with some chicken or shrimp. Saute the minced garlic in butter over low heat. Cook for several minutes until garlic is soft and fragrant. Bring water to a boil in a large pot.Add the cauliflower and cook for approximately 10 minutes or until the cauliflower is tender. 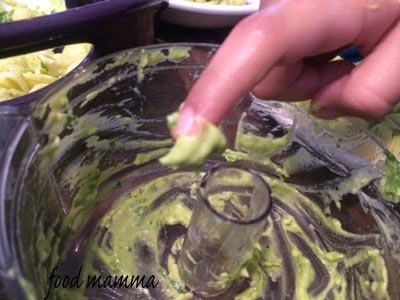 Using a slotted spoon, transfer the cauliflower to the blender. Add 1 cup of the cooking liquid, the garlic and butter, salt, pepper and milk and puree until smooth. Hubby and I celebrated our seven year anniversary on Monday! I feel like I was just reminiscing the other day about our honeymoon and that flashback has already been a year! Time really does fly. Although we went for sushi with our little guy on the weekend, I wanted to make hubby something special. My cousin had been talking about lobster mac and cheese a few weeks ago and I had been thinking about it ever since. Lobster definitely had to be in the picture, I just changed the cheese and pasta – cannelloni! 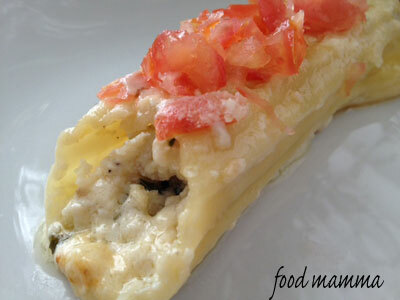 I filled the tubes with a flavourful mixture of ricotta cheese, sweet lobster and meaty prawns. 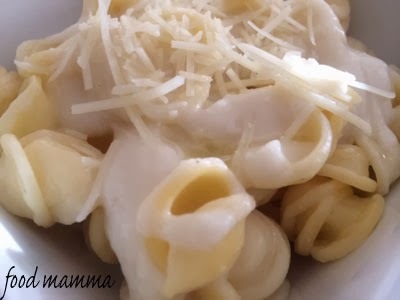 Instead of using a bechamel, I opted for an alfredo sauce which covered the filled pasta shells and baked them in some bubbly cheesy goodness. The richness was cut by the addition of some fresh tomatoes. The perfect indulgent meal to celebrate! Cook the onion and garlic in a bit of oil until softened. Combine with the cheese, seafood and basil. Stuff this mixture into the cannelloni and place in an oven safe dish. For the sauce, melt the butter in a saucepan. Add cream and garlic and let simmer for a few minutes. Add the cheese and a pinch of nutmeg and stir until the cheese has melted. Pour the alfredo sauce over the filled cannelloni and bake in a 350 degree oven for 25 to 30 minutes until golden and bubbly.